What is Close Air Support? A recent article tells us what CAS is. 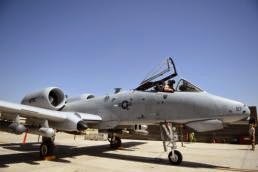 Read "What Close Air Support Is . . . And Isn't! ", Fighter Sweep.com, February 10, 2016. Learn more about CAS in Afghanistan. US Airpower Used in January 2016 in Afghanistan. In January 2016 there were 128 weapon drops by US aircraft in Afghanistan; the most for January in two years. In Iraq and Syria there were 2,695 weapons drops by US aircraft. So where is the priority? Once again Afghanistan takes a back seat. Read "Comparing Afghanistan and Iraq/Syria", Air Force Times, February 10, 2016. See also a related news story entitled "With fewer U.S. troops in Afghanistan, pressure grows for more air strikes", Reuters, February 10, 2016. Predators of Jalalabad. Read about the 62nd Expeditionary Reconnaissance Squadron Detachment 1's mission in Afghanistan in "Jalalabad Predators provide 24/7 overwatch in Afghanistan", Khaama Press, February 8, 2016. Shoffner on ANDSF. BG Wilson Shoffner, the deputy chief of staff for communications for NATO's Resolute Support Mission, briefed reporters via video conference from Afghanistan on Feb 11, 2016. He said that Afghan forces need to develop four capabilities to be successful - develop a readiness cycle, reduce the number of checkpoints, make leadership changes, and fill their ranks. No big news here with this video / transcript from the General. The Afghans still have difficulties in planning tactical operations; never mind develop a readiness cycle. We taught them long ago to set up check points - big mistake on our part and a hard lesson to unlearn - because it is easier to set up a checkpoint (and collect "taxes" on civilian road traffic) than it is to take to the hills and chase the bad guys. We have known for years about the leadership problems in the Afghan police and army but we don't use our leverage (our money) to get the ministries to fire incompetent and corrupt Afghan leaders at district, provincial, kandak, brigade, corps, and national level. The filling of the ranks has always been a problem - "ghost soldiers" (and policemen) will continue to be a problem when you have bad leadership - and desertions will continue to plague both the police and army as long as units in the remote areas are not supported by their leadership, live under terrible living conditions, are exposed to constant combat, don't receive pay, and are continually outclassed on the battlefield by the Taleban. So, once again, no big news here. You can read the transcript or watch the video by Defense.gov. Video - Testimony on ANDSF. On February 12, 2016 Defense Department officials testified at a hearing on capital hill before the House Armed Services Committee on Oversight and Investigations of the status of U.S. efforts to train and assist the Afghan National Security forces. Hosted by C-SPAN, 2 plus hours). "Work in Progress . . . " On February 12th DoD witnesses testified to a U.S. House committee on Afghanistan. A DoD News Release provides some details of the testimony. Read "DoD Officials Describe Afghan National Defense Forces As Work in Progress", DoD, February 12, 2016. New Pub. DoDD 5205.82, Defense Institution Building (DIB), Department of Defense Directive, January 27, 2016. Establishes policy, assigns responsibilities, and provides direction regarding the planning, managment, and conduct of DIB by DoD; and establishes the DIB Coordination Board. Probably a good reference for those advisors working at MoI and MoD at the ministerial level. Fighting in Sangin District . . . Again. Reports indicate that Sangin district located in the southern province of Helmand, Afghanistan is at risk of falling once again this year to the Taliban. Read more in "Sangin on verge of falling back into Afghan Taliban hands", BBC News, February 7, 2016. See also "Taliban are close to overrunning Sangin where 106 British soldiers died", The Telegraph, February 8, 2016. Some Afghan news outlets say that five security force members were killed on Saturday, Feb 13th. Kunduz Residents Fearful. Last fall the Taliban managed to infiltrate Kunduz city and, for a short time, occupy the provincial capital. The residents of the city are worried about a Taliban return. Read more in "Kunduz Residents Live in Fear of Taliban's Return", The New York Times, February 6, 2016. Tarin Kowt at Risk. It appears that the Afghan insurgents are getting the upper hand in many districts around the former Australian military base in Tarin Kowt. Australia forces completed their withdrawal from the Uruzgan province at the end of 2013. Insurgents have increased their freedom of movement and generally contain the ANDSF to their bases and checkpoints. With the lack of intelligence assets (ISR) and air support previously provided by the Coalition forces they Taliban now realize they can move around the terrain with impunity. Read more in "Afghan insurgents gaining control of territory around former Australian base in Tarin Kowt", ABC News (Australia), February 10, 2016. Baghlan Province - Heavy Fighting. News reports indicate that there was heavy fighting between the ANDSF and the Taliban in central Baghlan. Residents say that the ANDSF are indescriminately shelling Pashtun homess. Former PGov Kidnapped. Sayed Fazlullah Wahidi, the former governor for western Herat province of Afghanistan, was kidnapped in Islamabad. (ATN News, Feb 13, 2016). US Embassy Warning. On February 9th the US Embassy in Kabul warned its citizens in Afghanistan that insurgents were planning to attack foreign guest houses in the capital city of Kabul. (Voice of America, Feb 9, 2016). Zonal Chiefs of Police Get More Power. According to one news report the zonal police commanders will enjoy new powers. This news came during a ceremony for the newly-appointed 707 Pamir Zone police commander in Mazar-i Shariff in northern Afghanistan. The intent is to ensure increased coordination among the various security pillars in each of the country's regions. Read more in a news report by Pajhwok Afghan News, Feb 10, 2016.
Insider Threat Incident? An Afghan police officer was killed, in what might be a case of an insider attack, after firing on coalition troops near the main entrance of the Ministry of Commerce and Industries in Kabul on Tuesday. The NATO force soldiers returned fire, wounding the gunman, who later died in a hospital. (Reuters, February 10, 2016). Uigher Militancy - Just Next Door. Although they share a very small border (the Wakhan Corridor) the countries of Afghanistan and China share a common problem. One of insurgents. China is facing an Uighur insurgency. Read more in "Growing Uighur Militancy: Challenges for China", Eurasia Review, February 5, 2016. The Wakhan Corridor is an isolated part of Afghanistan - read more here in "What Life is Like in the Most Isolated Corridor of the World", Conde Nast Traveler, February , 2016. Royal Gurkha Rifles to Afghanistan. The Gurkhas from 2nd Battalion are heading to Kabul, Afghanistan as part of the UK's enduring support to the Afghan government. Their mission is to protect NATO military and civilian advisors working in government ministries, as well as UK advisors based at the Afghan National Army Officer's Academy. Read "Gurkhas Prepare for Afghan Deployment", Forces TV, February 11, 2016. Electricity - New Tactic? A shortage of electricity is the result of insurgent activity - blowing up the pylon towers that hold the transmission lines providing electricity to Kabul and other areas of Afghanistan. Read more in "More Afghan Electricity Towers Destroyed, Raising Fears of New Battle Tactic", Radio Free Europe, February 11, 2016. Suicide Attack on ANA Bus MeS. Three Afghan soldiers died and many more were wounded after a suicide bomber attacked a bus carrying members of the Afghan National Army in Mazar-e Sharif in northern Afghanistan on Monday, Feb 8th. Read "Deadly Suicide Blast Hits Afghan Army Bus", Voice of America, February 8, 2016. Senior Taliban Leader Dies. Mullah Rahmani, a senior member of the Taliban leadership council, has died according to a Taliban announcement on Tuesday morning. (Tolo News, Feb 9, 2016). Dynamics of Taliban Succession. Thomas Ruttig of the Afghanistan Analysts Network (AAN) examines what may happen when the Taliban leadership changes out. Read "The New Taleban Deputy Leaders: Is there an obvious successor to Akhtar Mansur? ", AAN, February 10, 2016. Taliban's Intel Chief Kidnapped. News reports say that the Taliban's intelligence chief and deputy was kidnapped in Quetta, Pakistan in separate incidents . (Pajhwok Afghan News, Feb 7, 2016).